Diamonds are known for being the hardest material on Earth, the name comes from the ancient Greek work ἀδάμας – adámas “unbreakable”. Natural diamonds form in the Earth’s mantle, under extreme temperature and heat over billions of years. Impurities and pressure conditions form coloured diamonds, which are rarer. Nitrogen atoms produce a yellow or brown diamond. Boron turns diamonds blue. Radioactive material turns diamonds green. Red diamonds are pure carbon, just like colourless ones. A rare deformation in atomic structure causes this colour change, called plastic deformation. This is when the growth of the crystal lattice has been compressed, affecting the way light refracts through the stone. Pink diamonds can form with or without the presence of nitrogen, and also in plastic deformation. Usually, natural coloured diamonds weigh less than a carat. The diamond is the birthstone for April. Both the largest cut and faceted diamond in the world at 545 carats. Found in the Premier Mine in 1985. The gemstone was cut into a cushion shape in a specially designed room underground. Used as an opportunity to test new cutting technologies, the same methods have since cut the Centenary diamond. The gemstone received blessings from Pope John Paul II and the Buddhist Supreme Patriarch of Thailand. The name is in honour of King Bhumibol Adulyade’s 50th coronation anniversary. Originally the largest uncut diamond in 1908 at 3,106 carats. Found in Transvaal, South Africa. Several diamonds were made from Cullinan, the largest of which Cullinan I, is known as the Great Star of Africa at 530 carats. Cullinan II, known as the Second Star of Africa, and both are part of the British Crown Jewels. Cullinan I sits in the Sovereign’s sceptre, remaining the largest clear cut diamond in the world. It can be worn as a pendant suspended from a brooch setting for Cullinan II. Cullinan II sits in the front of the Imperial State Crown, below the Black Prince’s Ruby. The image header of this blog post is the original rough diamond. A brownish yellow, found in the Democratic Republic of Congo. A young girl discovered it in an old mine dump from the nearby diamond mines. Considered too dense to contain diamonds, the rubble was unsorted. To reduce its flaws, 890 carats reduced to 407. 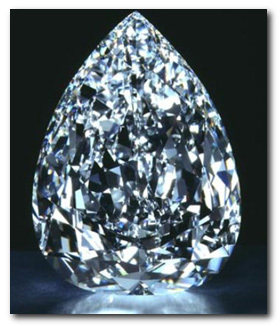 Like the Cullinan diamond, several stones cut from the original, the largest retaining the original name. Found by a goldsmith in India, not far from Kollur Mine. Then broken into three pieces, and the largest an almond cut. The name originates from the Prince Nizam of Hyderabad. The world’s largest cut black diamond, found in the Central African Republic, originally 587 carats. Swiss jeweller De Grisogono transformed it into a Mogul cut. Set in a white gold ring with 702 small white diamonds, the black diamond itself weighs 312 carats. Reportedly found in roughly 1650, in India, most likely the Kollur Mine. It weighed 787 carats uncut, originally a gift from Emir Jemla to Shah Jahan, the fifth Mughal emperor. Hortenso Borgio, a Venetian gemstone cutter refused to cut the diamond into several stones to erase the inclusions. Instead, he attempted to grind them away. This only ended in losing a great deal of weight from the original diamond. Shah Jahan fined Borgio 10,000 rupees, all the money Borgio had. The stone disappeared in 1747, after the assassination of its new owner, Persian ruler Nadir Shah. He had taken the stone back to his home in 1739, after invading India and sacking Delhi. Speculation suggests several outcomes: divided into numerous smaller gems, or recut into another famous gem, such as the Orlov, as the faint blue colour and rose cut is not improbable. Estimated upwards of $90 million. Found in the Premier Mine in South Africa. The name comes from its presentation for the Centennial Celebration of De Beers Consolidated Mines in 1988. Uncut, it weighed 599 carats. Cut by a team of experts, engineers and electricians, in a specialist room to minimise risk or damage. Removing 50 carats of unwanted material done by hand took 154 days. Finished in February 1991 at 273 carats. Its current owner is unknown. Found in the Jagersfontein Mine in South Africa in 1895, the Jubilee diamond weighs 245 carats. Uncut, it was 650 carats. Originally named the Reitz diamond, after Francis William Reitz, it was renamed to honour the jubilee anniversary of Queen Victoria’s coronation in 1897. The diamond was purchased along with the Excelsior (a larger, similar diamond) by a group of London diamond merchants in 1896. The Jubilee was sent to Amsterdam, polished by M.B. Barends, and 40 carats were removed, forming a 13 carat gem bought by Carlos I of Portugal. Cut at 203 carats, it was discovered in the Democratic Republic of Congo (then Zaire), in the Mbuji-Mayi mine in 1990. Pear-shaped, it’s internally and externally flawless. Uncut, it weighed 777 carats. The De Beers group bought it at the height of the country’s Civil War. In November 2000, a display of the De Beers diamond collection at the Millennium Dome narrowly avoided theft. The gang planned to escape via speedboat on the Themes with a haul of £350 million’s worth of diamonds. Fortunately, the Metropolitan Police discovered the plan and arrested them. One account tells of a French soldier who deserted from Indian service in the 18th Century. Living near Ranganathaswamy Temple in Srirangam (Tamil Nadui, India), he heard stories of an idol with diamonds for eyes. He would not have been able to see it as he was, as no Christian had ever been allowed access to the innermost parts of the temple. He disguised himself as a worshipper over many years. Eventually, he gained their trust. On a stormy night, he pried one of the eyes from the statue, and losing his nerve to remove the other, fled with it. The diamond passed from merchant to merchant, increasing in price each time. In this version, the diamond originally belonged to the Mogul rulers, amongst the spoils of Delhi taken by Nadir Shah. After Shah’s murder in 1747, an Afghan soldier appeared in Bassorah, bringing with him the Orlov and other diamonds. He offered them to an Armenian merchant, Grigori Shaffras. The soldier had no idea of the value of his items and Shaffras postponed the deal. The Afghan soldier disappeared, suspicious of a trap. Instead, he sold his riches to a different trader. The Orlov kept passing hands. Shaffras found him again and doubled his price. The Orlov had already sold. Shaffras tracked down the owner, and offered him double. The owner did not want to part with it. So Shaffras and his brothers murdered the man, and then the Afghan soldier. Over an ownership dispute, Shaffras killed his brothers. He travelled Europe, searching for a buyer. Catherine the Great invited him to court, she didn’t get the stone until 1772, when Count Girgory Grigoryevich Orlov bought it for 400,000 rubles. Count Grigory Grigorievich Orlov bought the diamond to rekindle his relationship with Catherine the Great and offered her the diamond. She didn’t accept his affections, instead she gave him many gifts including the Marble Palace in St. Petersburg. She named the diamond after him, and had the Orlov set in a specially designed sceptre. Another version states that Orlov was simply the negotiator between the merchant and the monarch, and the diamond is named after him to thank him for his service. Regardless, it remains in the specially designed sceptre. Have a look on our site to find the beautiful diamonds already on our catalogues, or set up a lot alert to be notified.